Uses: As an indicator of high temperature crystallization and as mineral specimens. Tridymite is a polymorph of quartz, meaning that it is composed of the same chemistry, SiO2, but has a different structure. Both quartz and tridymite are polymorphs with all the members of the Quartz Group which also include coesite, cristobalite and stishovite. Identification of tridymite without laboratory aid is limited to crystal habit and possibly index of refraction. What is needed to identify tridymite is a well formed crystal that shows the distinctive pseudohexagonal habit or the equally distinctive twinning. An index of refraction test would clinch the identification. Tridymite has a higher temperature phase called beta tridymite. Most tridymite is believed to crystallize as beta tridymite which has an hexagonal symmetry and later as the crystal cools, it easily converts to tridymite. The conversion from beta tridymite to tridymite is so easy that the beta tridymite's hexagonal crystals are outwardly preserved in their original form. The beta tridymite has a higher symmetry than alpha tridymite or just tridymite. The interior structure is therefore not hexagonal anymore and thus the hexagonal looking crystals are called pseudomorphs or "false shape". Tridymite's actual symmetry was thought to be orthorhombic, but has since been found to be no higher in symmetry than monoclinic. The presence of tridymite in a rock is helpful to petrologists (rock scientists) in determining the temperature of the rock at the time it crystallized. It will form from a melt at low pressures and at temperatures of approximately 870 degrees to 1470 degrees Celsius. Pressure and water content will vary this range, but it is usually a rather good indication of the temperature of the rock's crystallization. Below 870 degrees Celsius, beta quartz is stable and it will crystallize. Above 1470 degrees Celsius, cristobalite is stable and it will crystallize. Since a molten rock goes through various temperatures as it cools all three polymorphs could be present, confusing the issue. Tridymite is only metastable at normal surface temperatures; meaning that, if it could, it would slowly convert to the quartz structure. But this is a slow and complicated process taking thousands of years if it happens at all. It is so slow a process mostly because the transformation involves the breaking of bonds and the rearrangement of atoms. Atoms of aluminum and sodium in the structure may help the stability of tridymite as well. Color is colorless or white. Crystal System is monoclinic; 2/m or m (alpha tridymite) and hexagonal; 6/m 2/m 2/m (beta tridymite). Crystal Habit includes the always small but sometimes well formed crystals that are pseudohexagonal being pseudomorphs of beta tridymite. The crystals are platy with a hexagonal cross-section. 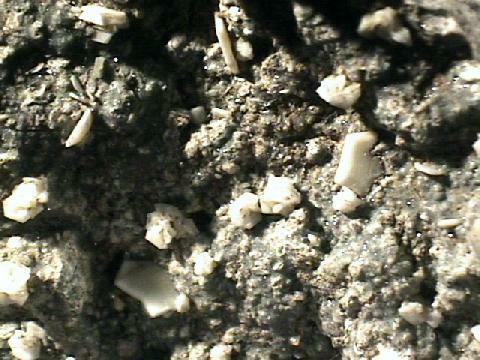 The more common habit is microscopic disseminated grains in volcanic rock. Twinning is common and often results in penetration twins that appear to have a second platy crystal growing into another crystal. The twins can look like a normal crystal that has been folded like a taco shell but with a sharp, not a rounded fold. By far, the more interesting twins are the six rayed trillings or "triplets" from where tridymite gets its name. Cleavage is poor in three directions (prismatic). Associated Minerals include cristobalite, sanadine, hornblende, beta quartz, olivine, pseudobrookite and augite. Notable Occurrences include Cerro San Cristobal, Pachuca, Mexico; San Juan Mountains and Yellowstone National Park, both in Colorado and Mt. Lassen, California, USA and Italy. Best Field Indicators are crystal habit, environment of formation (mostly volcanic rocks), color and index of refraction.